Enjoying a dream holiday in Los Roques does not automatically mean that you are just relaxing on the beach. Besides being a wonderful place, Los Roques offers a lot of possibilities in practising water sports. Los Roques is worldwide known place for kitesurfing. The nice weather and the wind invites to practice Los Roques Kitesurf. At Los Roques you find a lot of spots to kite surf. 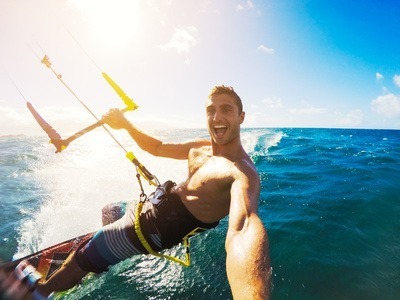 There are some very good kite surf schools which offer kite surf courses for beginners as well as for advanced kite surfers. You can also rent equipment there. We give you the possibility to see that best kitesurfspots in the Caribbean. We bring you with a boat to the places you cannot even imagine how beautiful they are. Stay at one of our Los Roques posadas specialised in offering kite surfers a service they need. We also offer a sailboat package, where you sail from island to island in order to meet everyday a new terrific kitesurfspot. If you want to take your own equipment you need to consider that the local airlines only allow to bring a 10kg luggage. We can organize a charter flight from Caracas where you will not have any problems bringing your own kite surf equipment. Weather conditions at Los Roques are always marvellous. The wind conditions for beginners are also very good during the whole year. Who is already an advanced kite surfer and wants to have the best wind conditions should visit Los Roques between November till April. Or are you looking for Los Roques Fly Fishing or Los Roques Diving ?